In short, a PPO discount is based upon billed charges that have been marked up. It’s a win-win for the provider - who gets paid above a market rate - and the insurance company - who gets to tout wonderful discounts in their plan. As one of my own doctors told me “we need to bill Cigna $100, just to get paid $50.” The cash price that I paid for this visit was $45. No insurance, no billing department needed. Chew on that for a moment. As Dave Chase describes in his book “Much of pricing in health care is set as a percentage of Medicare pricing. Why? Because Medicare uses a rigorous process to develop pricing that takes into account actual hospital costs and market variances.” When your PPO network advertises a 50% discount, it sounds nice but in many cases we have no clue what the starting price is and if that price is fair. 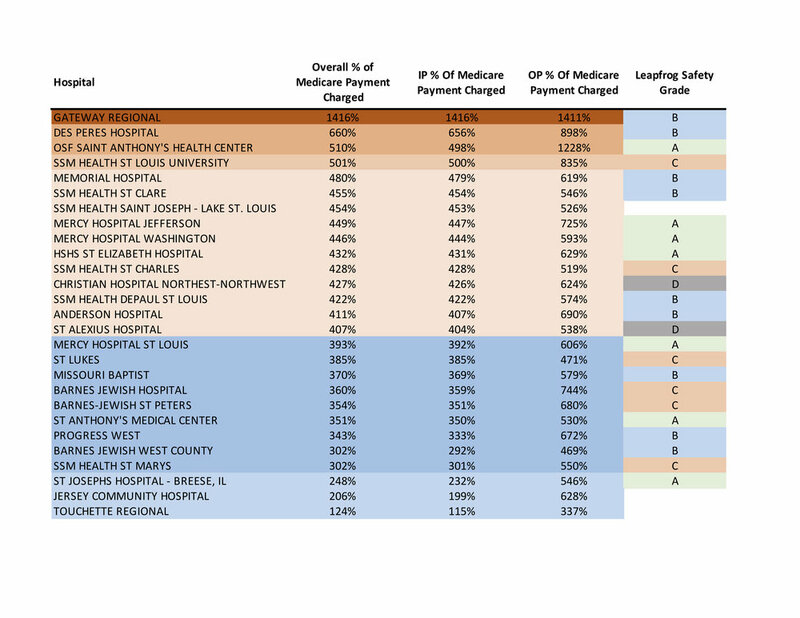 Below is a listing of hospitals in the St. Louis metropolitan area. We took CMS reported data from May 2017, the latest available, on overall billed charges as a percentage of Medicare. We then broke this down by In-Patient and Out-Patient. and just for fun, we threw in Leapfrog safety grades.